To all you foodies out there, you best prepare yourself to become green with envy because this post contains pictures of mouth-watering meals from my recent date night at Gerard’s Bistro. My fiancé Tom and I recently dined at Gerard’s and it’s safe to say that is was pretty much one of the best dinner dates we’ve ever had. Of course it’s really no surprise – Gerard’s has built a strong reputation as one of Brisbane’s best restaurants and in January was awarded 2 Chef’s Hats by the Australian Good Food and Travel Guide. Let’s just say we were very much looking forward to this dinner – and we had some high expectations! Head Chef Ben Williamson and his team produce unique, adventurous, and seriously delicious food inspired by the Middle East and this works perfectly with the gorgeous 1970’s-esque decor and exceptional service to create a great dining experience. We had an early sitting (6pm) on a Saturday night – Valentine’s Day to be specific – and on arrival we were swiftly talked through the menu by our lovely waitress. For entree, I chose the Yellowfin tuna with salted blackberries, Aleppo pepper and perilla ($23) and Tom selected the Crisp chicken skins with Aleppo kimchi custard and barberry salt($16). The tuna was amazing. It was so clean and flavoursome and we ate it with our hands as we were instructed which was actually quite fun in such a ‘fancy’ fine-dining environment! I loved this dish and was so glad we ordered it. The chicken skins came our shortly after the tuna and – what a contrast. These were rich and salty and boy was there a lot of them. The skins were very more-ish and satisfying but as someone who doesn’t eat a lot of ‘heavy’ food, I could only manage a couple. Thankfully, Tom was more than happy to take one for the team and finish them off. We took the advice of almost everyone we know who has been to Gerard’s and ordered the Slow roasted wagyu brisket for two with seasonal accompaniment for our main ($48). Gerard’s is pretty well known for this superb dish. On the advise of our waitress we also ordered one vegetable accompaniment – the Fried cauliflower, tahini, ras el hanout, smoked almond and pomegranate($14). 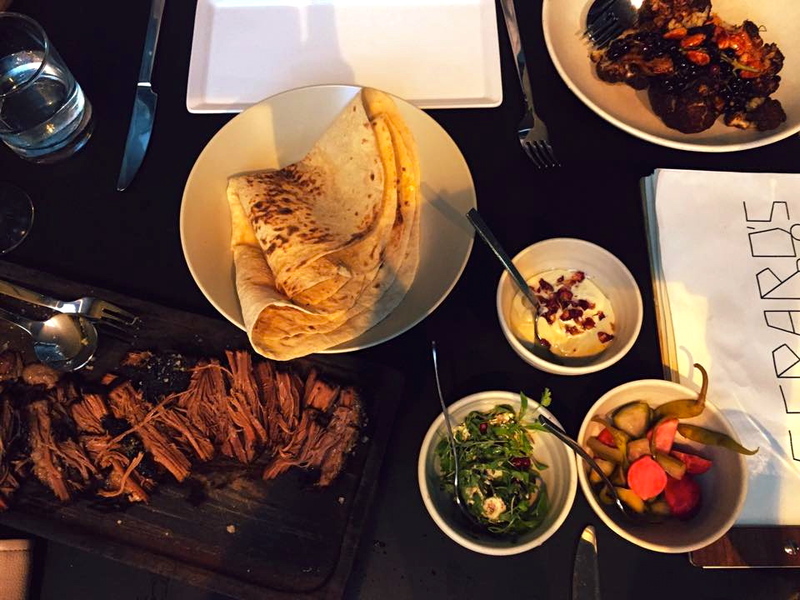 When the brisket arrived at our table it was served with some wraps, a miniature herb, goats cheese and pomegranate salad, some pickled vegetables and a yoghurt dressing. Our server carved up the brisket at our table and left us to put together our own dinner – again a lot of fun! We squeezed the lemon over the meat, and experimented with different combinations of the accompaniments in our tortillas. You remember those high expectations I told you about? This dish was a huge contributer to blowing them out of the water! Honestly, the meat was cooked to perfection (you really can’t go wrong with slow cooking)- it was juicy and full or flavour and combined with the spices of the cauliflower and the freshness of the herb salad – we were in heaven. I’m not ashamed to admit that we ate everything. There was not even a pomegranate seed left! Although we were already pretty full from the main, we chose to spoil ourselves (because LOVE and VALENTINE’S DAY) and we ordered two decadent desserts: the Pistachio biscuit with lokum, sour cherry, toasted marshmallow and raspberry ($16) and the Hazelnut praline with milk chocolate icecream and roasted almond milk jelly ($16). ERRMMAAGHERD is all I can say – these were both amazing. The pistachio biscuit, was more like a macaron but to that I say Hells Yeah! The hazelnut praline was gorgeous and light and I can honestly not think of a better way to end our evening at Gerard’s – it was heaven on a plate. In fact our whole experience at Gerard’s was just perfect. The service was quick and friendly, the food and wine superb and we will definitely be going back again.